Tabraiz Shamsi's 'Masked Magician' celebration, which the bowler pulled after taking a wicket, has caught the attention of the ICC who have subsequently banned it. South African spinner Tabraiz Shamsi is known as much for his Chinaman bowling as he is for his elaborate celebrations. But Shamsi will not be able to pull out a mask again on the field as the International Cricket Council has banned him from indulging in his entertaining mask celebration. 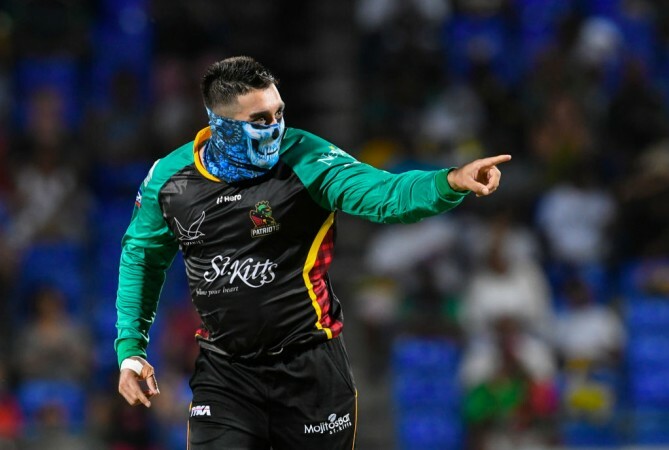 In what had become a trademark celebration, after taking a wicket Shamsi used to run off while pulling out a neck scarf resembling a mask and covered half of his face. Shamsi has been using this celebration in the ongoing Mzansi Super League (MSL) in South Africa and had also done so in the Caribbean Premier League (CPL) earlier this year. But the ICC has now banned the "Masked Magician" celebration. "I got told before the game (against the Tshwane Spartans on Wednesday) that my mask celebration has been banned. "It definitely could have come out against the Spartans but unfortunately it has been banned' but it is what it is'" Shamsi said after his side Paarl Rocks lost to the Pretoria side by four wickets. Although the exact reason why the celebration was banned is unclear, it seems as though the celebration was deemed disrespectful towards opposition batsmen. But Shamsi says these over the top celebrations help him keep calm and feels that the fun factor should not be taken out of the game, especially T20 cricket. "These celebrations help me to keep calm. "We are playing T20 cricket' fans come out here to spend their hard-earned money cash to watch us play. "I am just trying to have fun to give something extra to the people who come to the stadium to watch and support us'" he said after the loss to the Spartans. Shamsi, not to be too disheartened, has brought back an old classic to replace his now departed masked magician–the shoe-telephone celebration. Enjoying myself n spreading happiness and smiles to others is all it's about#ShoePhoneCelebration ? ?